Please email with any questions or if additional photos are needed..
PA residents must pay 6% sales tax unless you have a valid resale number. We mail to the United States only. Purchaser is responsible for Priority Mail and Insurance Costs. All Sales Final .. No Returns Accepted .. 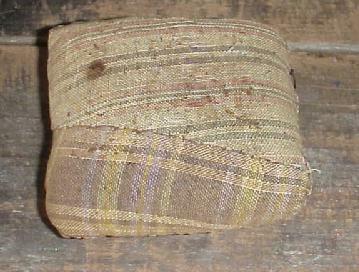 Early Pa. Brown Check Homespun Pin Cushion ..
Pin Cushion shows it once had pins covering both sides .. old brown pin marks and two primitive age wear holes on each side .. all expected for this authentic pin cushion. 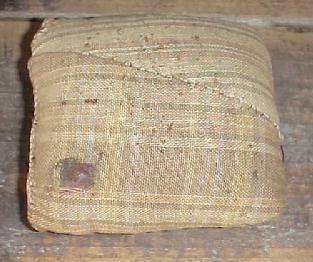 Brown homespun is rarely seen today … this pin cushion is a great old sewing piece. Hand made and hand sewn ..